Quiet moments by the fire at night are a dreamy ending to the excitement of 100s of attractions, shopping, and eating in nearby Pigeon Forge, under 3 miles from A Cheerful Heart’s door. Let the eloquent songs of the birds greet you each morning through the doors of your bedroom’s private balcony entrance after restful nights of sleep in the king-size bed in the master suite. Save money on a small family vacation and bring the kids along with extra sleeping accommodations of a twin bunk bed and futon. Up to 5 guests are privileged to cozy furnishings and homey atmospheres in the open-concept living room, fully loaded kitchen, and charming dining area. Look forward to your downtime in this 2-bedroom, 2-bathroom cabin with afternoons and evenings filled with gaming on the authentic “retro” video game arcade with 60 of the classics, including Frogger, Pac-Man, Galaga, and Space Invaders along with an air hockey table to challenge one another. When you have the urge to watch a good flick, skip the expensive theater prices and watch a movie in your cabin’s private home theater on the 60-inch flatscreen TV with surround sound, and the option to play your favorite DVDs from home or hundreds of titles on Netflix. With Pigeon Forge so close, trips to and from town for shopping, eating, and playing are convenient and quick! Return from afternoons of indoor snow tubing or indoor skydiving on the Parkway to rest and unwind in the warm, soothing bubbles of the outdoor hot tub. Let your big dinners from Dolly Parton’s Stampede and The Peddler Steakhouse settle while watching TV on the living room flatscreen as a warm fire burns in the gas fireplace. 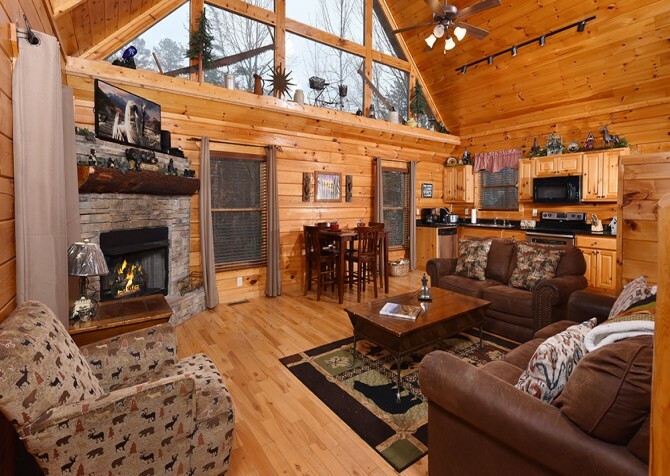 Enjoy the crisp morning mountain air with a fresh cup of coffee in hand from the fully equipped kitchen before heading to scenic hikes in the Great Smoky Mountains National Park or shopping trips to the Tanger Outlets in Sevierville. 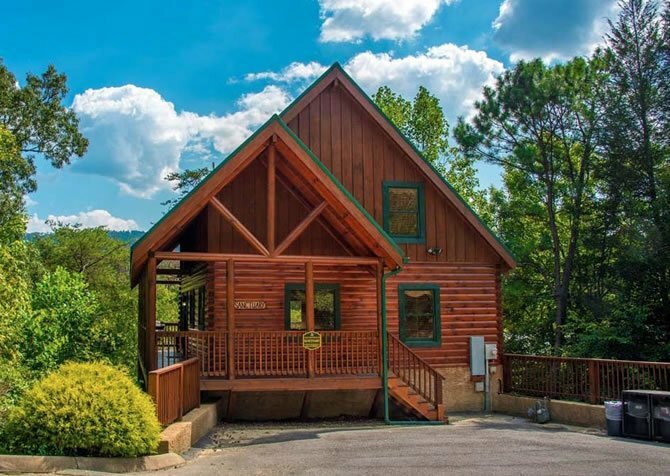 The authentic log-style architecture shrouded by lush, green mountain forestry and numerous Pigeon Forge attractions nearby lends guests an authentic, dreamy Smoky Mountain vacation that will relax, inspire, and invigorate during your stay in A Cheerful Heart. 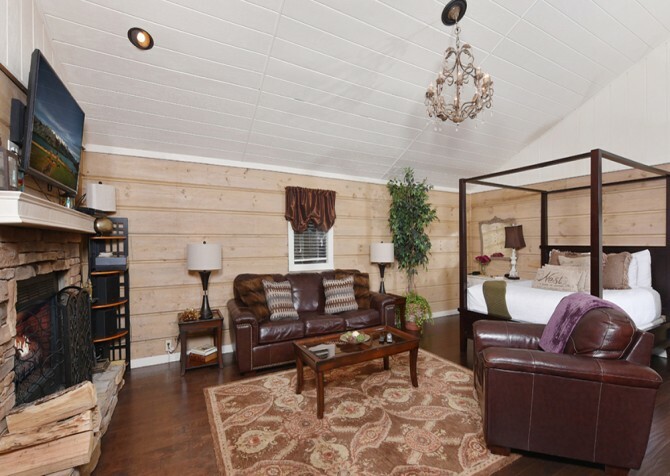 Plush leather sofa seating and a cushy chair settled in front of a warm gas fireplace is the perfect atmosphere to unwind after fun-filled days at Dollywood and The Island. Click on the living room flatscreen TV to relax while watching afternoon shows or pick up that book you have been meaning to finish before plopping on the pillows. Squeeze in an afternoon nap on the cozy couch while faint midday sunlight drifts through the forests and through the quaint windows of the living room. 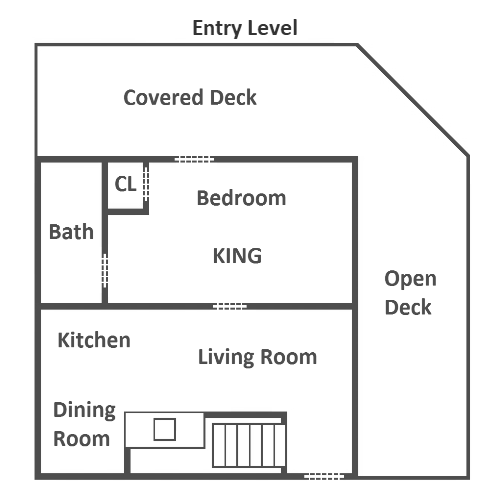 The open-concept floorplan creates an airy feel to all the common areas and provides ample space to move from cooking to relaxing in only a few steps. The charming, fully loaded kitchen of A Cheerful Heart lends the ease of cooking in your own home, with modern appliances, tools, and tableware, right in the comfort of the cabin. Put together multi-course meals using the stovetop and oven or simply make a quick meal to save money and appetites for your 4-course meal at Dolly Parton’s Stampede. Use the microwave for buttery, warm popcorn to enjoy in the home theater or as a quick-fix to midnight cravings by popping in your Old Mill leftovers. Settle into your chairs around the dining table to enjoy breakfast, lunch, and dinner by the window with Smoky Mountain forest views. Clear the 4-chair dining set after dinner to begin enjoying board games and laughs late into the night before turning in to the privacy of your room each evening. Share hearty breakfasts in the soft morning light floating through the trees while planning your hikes to Alum Cave, Rainbow Falls, and Andrews Bald. Plug in your laptop and use the cabin’s wireless internet to catch up on work emails, add your pictures from your Smoky Mountain adventures to your social media, or explore the Cabins for YOU blog for new excursions and ideas while seated at the table, letting the comings-and-goings of the birds distract your eyes from the screen every once in a while. 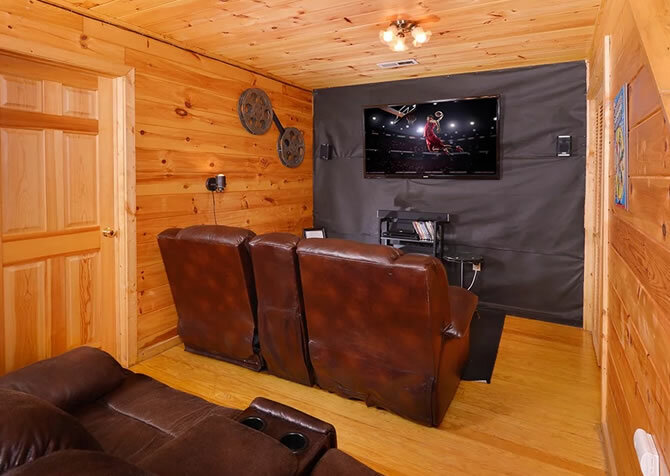 Cabin downtime isn’t all relaxation and tranquility, so head to the cabin’s theater and game room to let the kids and the young-at-heart play and have fun while staying in A Cheerful Heart! Challenge the kids on the air hockey table or teach them a thing or two on the retro arcade gaming system with all your classic favorites before enjoying feature films at your in-cabin movie theater! The impressive 60-inch flatscreen TV and surround-sound system in A Cheerful Heart’s theater zone will make you never want to spend money on movie theaters again! Tiered seating with cup holders and blackout capabilities provide an awesome screening experience, right in the comfort of the lower level. Bring your favorite DVDs from home or use the cabin’s Netflix account to watch new movies, shows, and documentaries! After tucking in the kiddos on the twin bunk and modern futon in the lower-level bedroom, cuddle under the covers of the king-size bed in the master suite while enjoying some late-night TV on the flatscreen, reading a book under the bedside lamp, or simply falling right to sleep after exciting days in downtown Gatlinburg and Pigeon Forge. Unpack clunky suitcases into the closet and dresser to avoid unfolding all your clothing while looking for the perfect outfit for your romantic dinner downtown. With ample seating and lovely forest views, relaxing on A Cheerful Heart’s back deck will be a highlight of your stay. Take advantage of lovely climates with cabin cookouts on the charcoal grill before hosting an outdoor lunch on the deck’s picnic table. Sway back and forth, hand-in-hand, on the deck’s glider bench while soaking in the array of natural colors in the forest each day in between trips into downtown Pigeon Forge. Worried about taking trips into town? Parking for 2 is paved with a flat, motorcycle-friendly driveway. 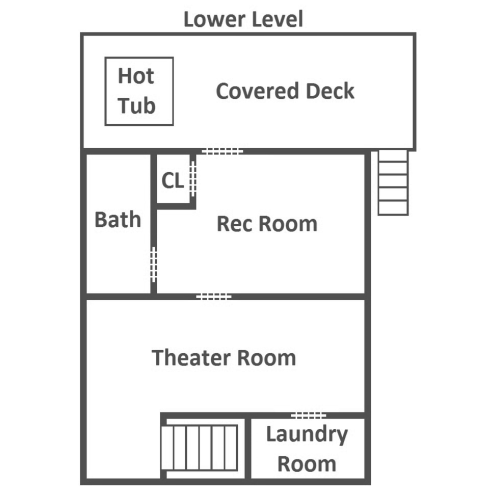 Plus, there are 0 steps into the cabin, meaning rest and relaxation are mere seconds away. After running around exploring all day, the outdoor hot tub (just outside the lower-level bedroom) is the perfect fix for tired muscles and excited minds before hopping into bed each night. What else does A Cheerful Heart have to offer? Glad you asked. Dance parties await with the groovy CD player and the virtual world is never far away with complimentary high-speed Wi-Fi. Less than 3 miles to the heart and soul of Pigeon Forge, A Cheerful Heart gives you a prime location to downtown attractions, restaurants, shops, and outdoor activities! Don’t be shy — head into town for exciting rides, scrumptious meals, Smoky Mountain mementos, helicopter tours, ziplining, and more! The original resting place of the old iron forge for which the once little mountain city once got its name, The Old Mill District is a great stop for everyone with the savory down-home cookin’ of Old Mill Restaurant, numerous little shops, and a winery right on the river banks! Take the family snow tubing any time of year at Pigeon Forge Snow, the country’s first attraction like it, where 100% water-made snow forms multiple lanes to race down and a play area where the whole family can work on a snowman — all while wearing shorts in the 65-70-degree maintained temperatures! The area’s only completely paved trail leads to the tallest waterfall in the Smokies, the 80-foot cascading Laurel Falls. Under 3 miles roundtrip, this is a great hike for families and those looking for some beautiful scenery without the long haul. "We have stayed in A Cheerful Heart twice now and have loved it! It makes for a great getaway and feels just like home!" "We stayed at the Cheerful Heart, and it was wonderful. Can't wait to do it again. The cabin was beautiful."